Having first apprenticed as a decorative painter, the Swiss-born Waldemar Fink then studied at an art school in Munich, where he familiarized himself with the German Romantic landscape tradition originated by Caspar David Friedrich. He returned home to Switzerland, and settled in the mountain village of Adelboden and then the city of Bern. Fink frequently visited the region of the Swiss Alps with towering peaks that he made the chief subject of his vivid, glowing paintings, which brought him fame at home and throughout Europe. In the choice of his subject matter, Fink was working in a well-established Swiss tradition. The first great mountain painter of the country had been Ferdinand Hodler (1853-1918), who, especially late in his career, painted many depictions of the majestic Alps and occasionally heroic figures set before the mountains (figs. 1a-g). And these radiant works were not simple landscapes but reflected both the spirituality of nature and his Swiss Reformed Protestant theology. The mountains were a place of mystical revelation and symbolized transcendent grandeur and inspiration. They were “uniquely Swiss.” Continuing the approach of Hodler was Oscar Wilhelm Lüthy (1882-1945), who also studied in Bern and Munich, and in the early years of the twentieth century, before he turned to a more Cézannesque manner, was painting Swiss mountain views often with rural figures included (figs. 2a-f). This subject matter was also to be found in the work of the Italian-born Symbolist painter Giovanni Segantini (1858-1899), who was so attracted by the vivid scenery of the Alps from which he drew mystical nourishment that he settled in a remote area of Switzerland in 1886. He sought to capture the awesome beauty of the mountains, to express a pantheistic symbolism, and to most notably replicate the intense light he found in Switzerland (figs. 3a-j) through a chromatic and tactile approach to light via color that is expressed by what has been labeled a Divisionist technique, a style that had originated in northern Italy in the late 1880s. Other of Segantini’s fellow Italian Divisionists, such as his younger friend Giuseppe Pellizza da Volpedo (1868-1907), who along with his social concerns also found in nature “the true source of painting and life,” and the more “humanitarian” Angelo Morbeli (1853-1919), whose technical experimentation focused on backlight and chiaroscuro, were also drawn on occasion to the rural subject matter of shepherdesses and depictions of the towering mountains (figs. 4a-b and 5a-d). In this early work, possibly his masterpiece, Fink shows his affinity with this mountain tradition and manner of painting in which light was the locus to emphasize the deeper meanings of life in nature and also reveals the formula he often employed of placing humble figures in the foreground set against the vast expanse of the Swiss mountains in the background (figs. 6a-e). 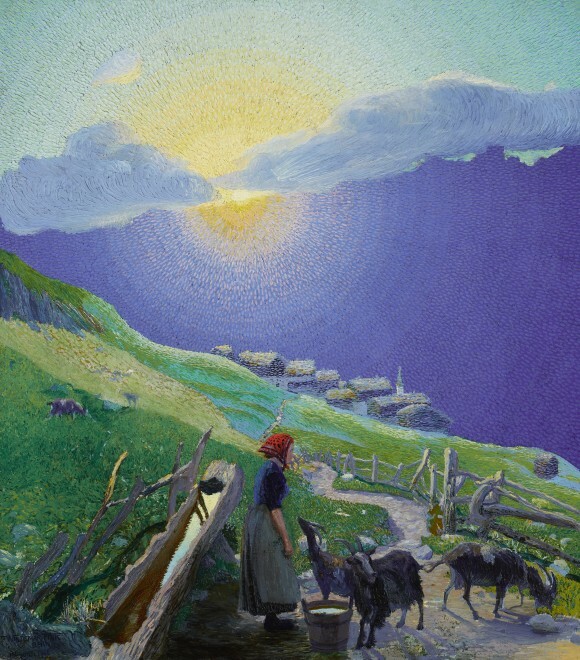 It is an idyllic view of Swiss rural life, with the shepherdess, her red head-scarf the focal point of the composition, tending to her goats. Beyond is a verdant field and nestled in the valley below is a little town with its buildings clustered around a church, very reminiscent in fact of the view of Adelboden (fig. 7). Engaged in her chores, the shepherdess seems to ignore the dramatic rising sun that is just breaking above the mountains and casts a brilliant light through the cloud-filled sky, reminiscent of the effect created by Pellizza da Volpedo in his powerful painting The Sunof 1904 (fig. 8). Fink seldom achieved such a perfect balance between the human and the natural world in his beloved alpine views.